The United Bikers of Maine will hold their 32nd annual Toy Run Sunday, Sept.8. Bikers leave from various locations around the state and gather at the Augusta Civic Center at 10:30 a.m. 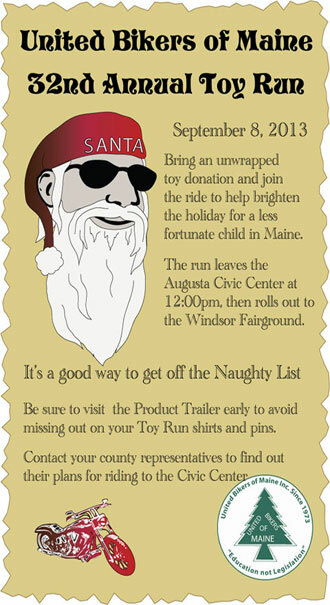 They will leave the Augusta Civic Center at noon for the Windsor Fairgrounds. The event will be held rain or shine. Have a safe ride and thank you for all you do!